In our daily work we focus on learning our customers’ requirements, and then meeting them through the monitoring of global trends and technologies. This is why we can offer the highest quality, comprehensive service and support throughout all stages of the project. 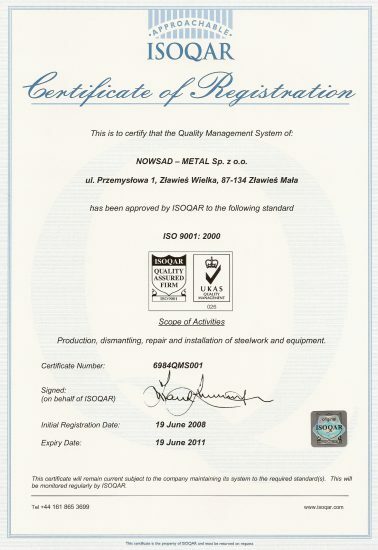 With the implementation of a quality management system consistent with international standard DIN EN ISO 9001:2000 in the field of production, dismantling, repairing and instalation of steelwork and equipment we have managed to improve our business processes. 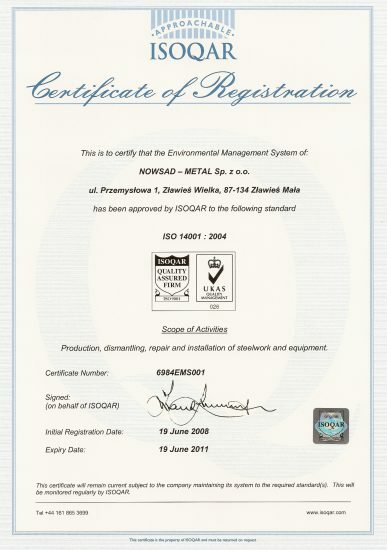 This ensures the highest level of products and services, continually subject to restrictive control procedures, offered by Nowsad-Metal Sp. z o.o. to our customers.